Ross Gannon and Nat Benjamin met on Martha’s Vineyard in the 1970s. Gannon (far left), an engineer by training, was building houses from salvaged timber. Benjamin, after kicking around the Caribbean and Med with his family on his boat, was working at Martha’s Vineyard Shipyard. Their paths overlapped, and a friendship sprang up, but it wasn’t until 1980 that the two decided to open a yard together. 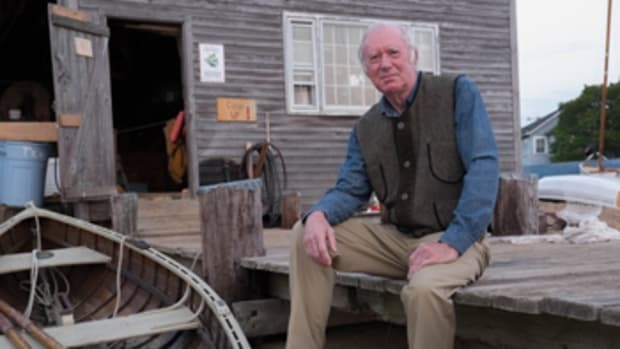 By this time, they’d noted the number of wooden boats in the harbor that needed help. Over a series of days working together to repair the structural frames on Gannon’s 36-foot Casey cutter Urchin, they must have realized what a good team they made. 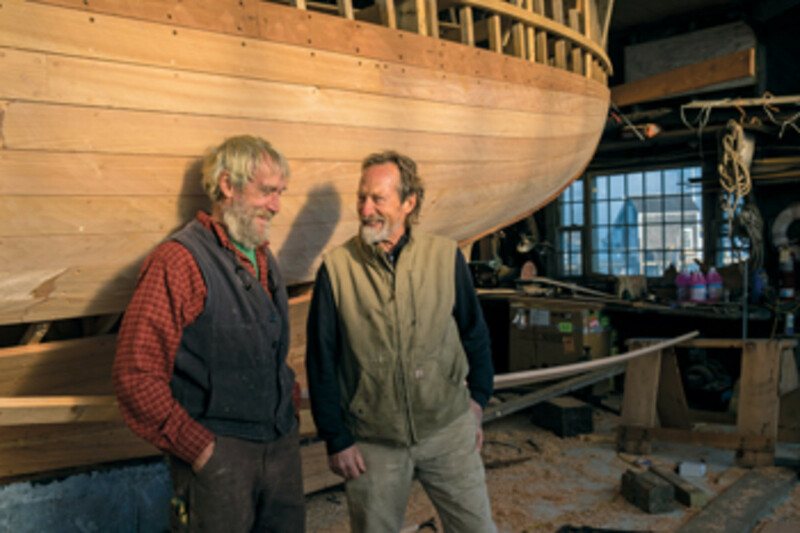 They had complementary skills and shared passions for working with wood and sailing. The rest, as they say, is history. Gannon & Benjamin Marine Railway (gannonandbenjamin.com) is one of the fabled wooden yacht yards of the world and has built and restored boats of all sorts and sizes — from new canoes and yacht tenders to the restorations of the 63-foot Alden schooner When and If and the 72-foot yawl Zorra. 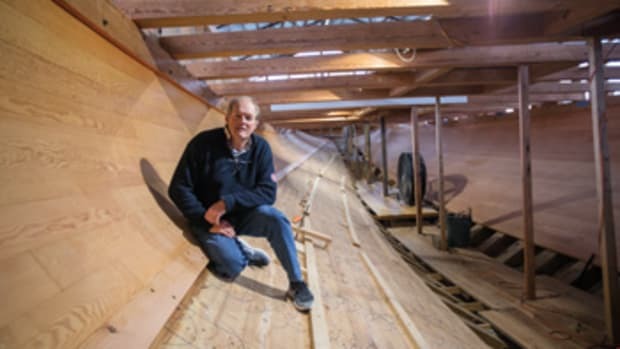 Their most recent project is building the Benjamin-designed 31-foot canoe-stern gaff sloop Artemis. First memories of being on a boat: (NB) Messing about on the Hudson River in the early years was my first experience boating — or more accurately rafting. Somehow we lived through our Huck Finn antics on the river. As a 12- or 13-year-old, I spent two summers at the Pleasant Bay Camp in South Orleans, where we sailed lovely little 18-foot daysailers called “bay birds.” These gaff sloop centerboarders were designed by Starling Burgess and, unsurprisingly, sailed beautifully. (RG) My parents owned an 18- to 20-foot wooden sloop on Lake Huron, Michigan. I was perhaps 4. 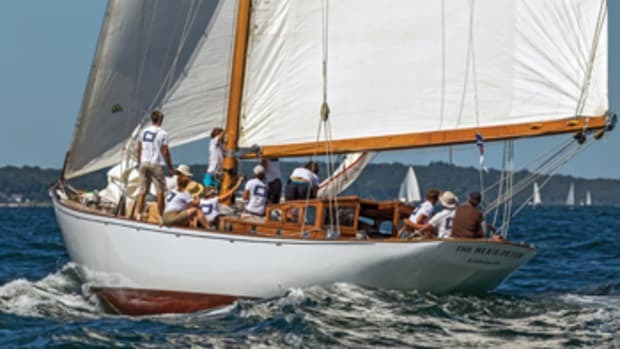 First boat you owned: (NB) A 1921 Johan Anker Norwegian modified 10 Meter Class sloop. 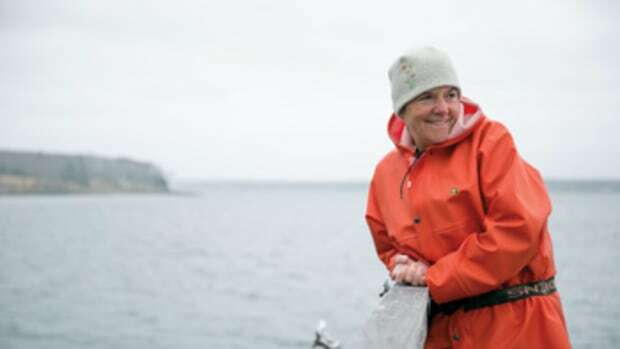 She was 60 feet on deck, had a 39-foot waterline, 10-foot beam and 7-foot draft — a magnificent vessel. We sailed her for a year in the Med before taking her across to the West Indies and eventually to Martha’s Vineyard. (RG) At 16 I bought a wrecked 25-foot power cruiser. It needed a new keel timber and engine and lots more, but two of us fixed her and used her for two years. Last or current boat: (NB) We own a traditional 50-foot schooner that I designed for our family. Built at Gannon & Benjamin, she is a user-friendly, low-gloss, comfortable cruising vessel that serves us well. (RG) A 45-foot sloop my wife, Kirsten, and I built, with a lot of help from friends. Favorite boat you’ve owned: (RG) They’re all my favorites when I’m using them. 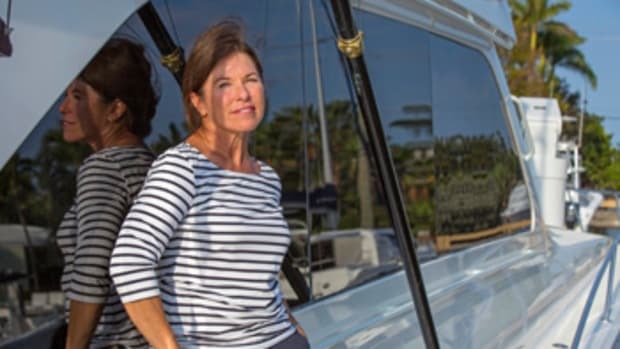 Your dream boat: (RG) I think everyone should have a boat for every use — a cruising sailboat, a daysailer, a pulling boat, a fast runabout — so I dream about what would be a good boat of each type. I really have no favorites — I like any good boat. 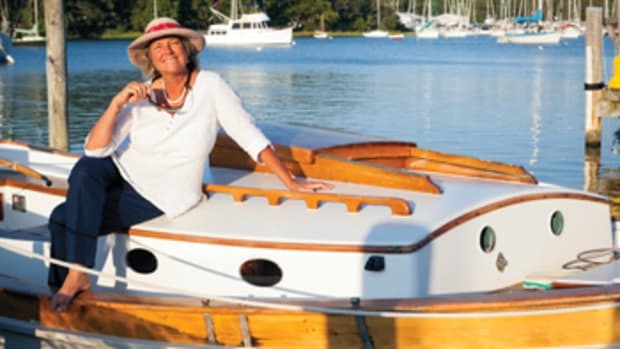 Favorite boat you’ve built: (NB) Building Charlotte was a great experience and especially enjoyable, given the characters involved, and without a deadline to finish; it was a four-year project. Most rewarding professional experience: (NB) Working with a team of talented men and women on our numerous projects over the past 40 years. Our workmates are also our shipmates, and along with most of our customers, they are close, personal friends. 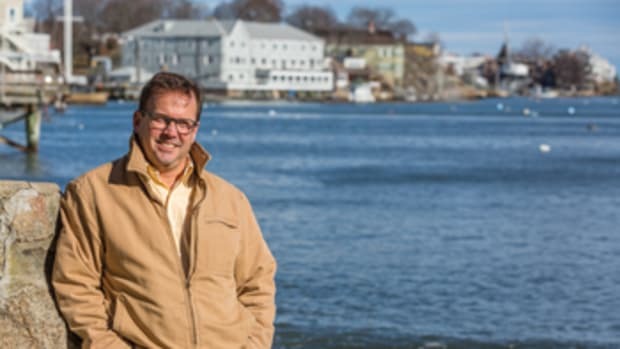 When Ross and I started our boatyard in 1980, we never imagined what great things and friendships would unfold. (RG) Partnering with Nat and creating our little boatyard. Most memorable experience aboard: (NB) Memorable experiences aboard are too numerous to contemplate, short of a book. However, voyages with my family and friends continue to be a source of immeasurable enjoyment and satisfaction. I’m so grateful for all of these adventures at sea. (RG) I can’t condense it to one moment. My fondest memories are extended cruises with my kids, where life aboard becomes simplified and close. Favorite destination so far: (NB) Unequivocally Vineyard Haven, our home port. It is a working waterfront community that encourages men and women of all ages to be creative, thoughtful and independent. And we have a really good time. (RG) No particular favorites. I just like gunkholing the New England coast — discovering new anchorages. Favorite nautical book: (NB) Anyone interested in the sea should read The Riddle of the Sands by Erskine Childers. Favorite nautical cause you support and why: (NB) I support several organizations with a nautical base. Mystic Seaport Museum (mysticseaport.org) is unquestionably our nation’s finest maritime museum. (RG) Sail Martha’s Vineyard (sailmv.org) because it provides free sailing lessons and access to boats and boatbuilding for our island kids. Skip Novak is a racing and adventure legend. 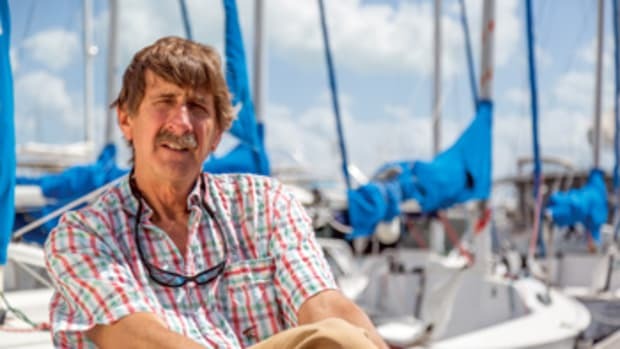 He participated in the Whitbread Round the World Yacht Race four times, beginning in 1977, when he navigated the British cutter Kings Legend to a second-place finish at the age of 25.